Screenshot of the Fox Weboji demonstration, included in the library Github repository. You can test it here: jeeliz.com/demos/weboji/demos/threejs/. In this tutorial we explain how to replace the Fox mesh by your own 3D model. When it is done, the Jeeliz Weboji meshConverter puts the base model and the morphs together to build a usable Weboji usable by the API. Let’s see together how to get this done. The 3D model should ideally be a head. Although it is possible to add a neck, the more your model is high poly, the more costly it will be to be rendered and animated. 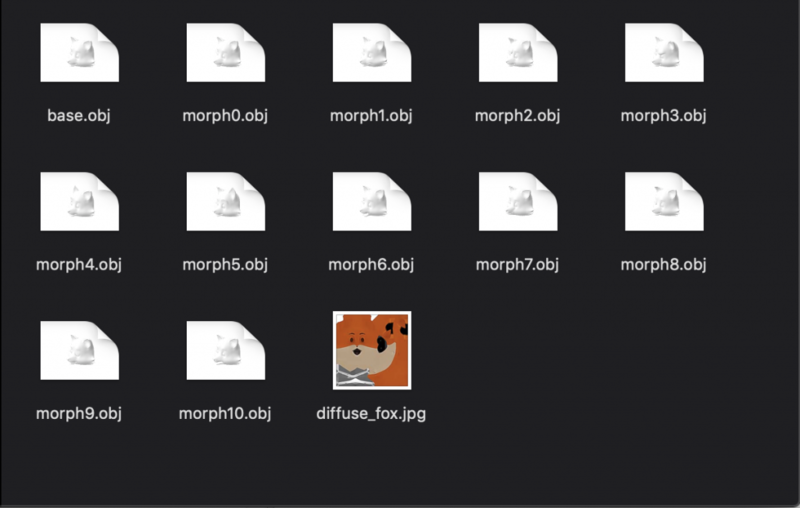 On the Github repository, we can find the base morphs of the fox here: meshConverter/meshes/Fox_V2. We can now create our weboji by using the meshConverter. The meshConverter is included in the Github repository for the Jeeliz Webojis. In the created folder we’ll find a subfolder “meshConverter”. We can open it and copy/paste the folder where you stored you morphs and base 3D model in this meshConverter folder. The meshConverter should bundle our morphs and our base 3D model into a JSON file readable by the Jeeliz Webojis API. Our newly created JSON file should be in the ../assets/3D/meshes/ folder, named name_of_your_3dmodel_folder.json. Congrats! You have created your first Weboji! You can now use it in your web app with the Jeeliz Weboji API. You will find the documentation on how to use the API on the Github repo. Stay tuned for an upcoming tutorial on this topic. And give us the link to your creations, we love to communicate and to share applications and demos using our libraries! The source code of the meshConverter is very readable, with some 3D programming skills you can adapt it to your own 3D format or tweak it to your own workflow. The THREE.JS middleware importing the generated JSON file is also included in the Weboji repository, so you can change it easily.